The United States won yet another game against a team that looked to have the better of them in the first half. This time, however, it was shrewd referee-management rather than fitness that turned the tide. Both teams were largely as expected, though in the absence of his preferred keeper, Sandra Sepúlveda, Fabian Taborda went with Catalina Perez rather Stefany Castaño, who had started the opening game against Mexico. Jill Ellis returned Megan Rapinoe and Tobin Heath to their more natural flanks and made clear in a pre-game interview that their inverted deployment against Nigeria was a specific tactical adjustment for that game. The best explanation of the change that I’ve seen comes from Coleman Larned‘s “midfield shape adjustments” analysis for Empire of Soccer: Ellis wanted them tucking in to bring Meghan Klingenberg and Ali Krieger into the attack (I’ve just linked to the second page of his analysis, but the whole thing is worth checking out). Returning Heath to the right also allowed her to help against Lady Andrade if necessary. 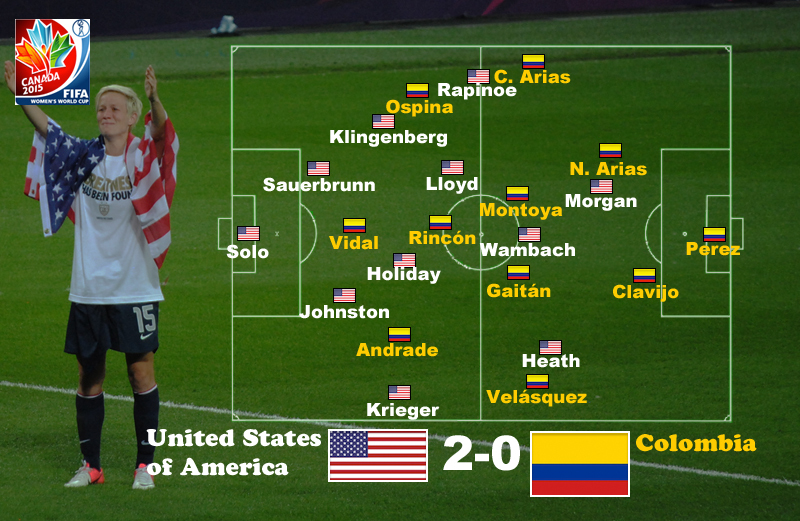 Though expected to defend deep and spring forward, Colombia actually pressed the United States on the flanks and after a strong opening 10′ by the US were relatively fluent in possession, controlling the tempo of the game (though it is not entirely clear that the United States were trying to speed the game up either). It is tempting to say that they had the better of the United States in the first half, so surprising was their performance. Yet the US had more possession and the better chances on goal, leading Colombia 7 (3) – 6 (0) in shots (on goal) overall. Colombia did not get their first corner kick until 39′. While they had a very good first half, their advantage was relative to expectations rather than absolute. In the first half, many US fans (and players, to judge by Abby Wambach’s post-game comments) were critical of French referee Stephanie Rappart, unfairly in my estimation. But there can be no doubt that the United States did a better job of adapting to the refereeing to turn the game to their advantage. Because so much was made, at least in US broadcasts, of Colombia’s propensity to go down easily, it’s worth emphasizing how brilliantly Alex Morgan manufactured the 46′ penalty awarded her, the game’s clear turning point despite Wambach’s miss. Sepulveda’s slide was not only slow enough for Morgan to push the ball past, but more than slow enough to have been cleared easily by a player eager for a chance on goal. Morgan certainly had no problem getting one leg over the tackle, and then hung the other down to ensure contact and a red card. Contact makes the foul, so if you insist I’ll happily agree it was a po-TAY-to rather than a po-TAH-to, but Morgan’s play here had more of the style of Ronaldo than of Messi. Likewise, Rapinoe’s persistent drives into the box showed good recognition of how Frappart was calling the game. Having experienced Angela Clavijo’s hip-check at 62′, she recreated virtually the same situation at 65′, Clavijo again obliging to force Frappart’s hand in awarding a second penalty. (It is worth noting that Clavijo did get the ball in the earlier tackle, which explains the first no call.) Overall, the United States more effectively adjusted to the style of refereeing, and that shift won them the game. In the final 15′-20′ of the game, Ellis subbed in Morgan Brian and Christen Press, her likely replacements for Lauren Holiday and Rapinoe in the game against China. Alex Morgan and Press had a promising move at 77′ that makes me wish that Press might replace Wambach as a starter, bringing in Kelly O’Hara on the flank; but this will almost certainly not happen. China will be a very different opponent, and with two of the United States’ most creative players sitting out the game has a reasonable chance of going to penalties. Let’s hope the US are practicing.